The Paris Commune, one of the most influential events in human history, arose from the Franco-Prussian War (1870-71). It marked the arrival of the working class on the world stage as the most revolutionary class in history. It opened the era of working class world revolution, laying the basis for the Russian and Chinese Revolutions. The Paris Commune was the first time in history that the workers took power and used it to organize and run society in their own interest. Most important, their legacy teaches us that we must fight for communism, and nothing less. The lessons of the Paris Commune are fundamental to the strategy of the International Communist Workers’ Party: mobilizing the masses to build a classless world – without money, wage slavery, racism, sexism, xenophobia and imperialist wars. A communist world where the masses plan, produce and distribute everything to meet their collective needs. In the Franco-Prussian war, the Prussian rulers fought to forge a unified German nation at the expense of some French territory. The French capitalists were fighting to stop this and to maintain their hegemony over continental Europe. This brutal war raged for about a year, with tens of thousands of casualties on both sides. The French army was decisively defeated. The French Emperor Napoleon III was taken prisoner by the Germans, and the German army besieged Paris. The masses in Paris were mobilized. They sensed the danger and opportunity of the situation. They rejoiced at the fall of the hated Emperor, who had made their lives even more miserable by reorganizing Paris for the rich. Masses had been expelled from their dwellings so the rulers could build wide boulevards. They hoped these would prevent the masses from constructing barricades as they had done in the insurrection of 1848. In 1792, the rising French capitalists had overthrown the French nobility and declared a Republic. Now in 1871 the French capitalists declared a new Republic. They hoped it would confuse the masses and win them to support their bosses in a patriotic fervor. 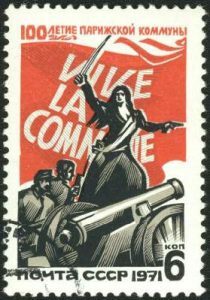 A small communist movement that arose during the French Revolution was quickly smashed. But 1871 was not 1792. The working-class movement had matured tremendously. The Communist Manifesto (1848) had shown the way forward. Marx’s International Workingmen’s Association had members in Paris. They rose to the occasion, advocating arming the masses. And the masses went further: they fought to build the Commune. The Parisian National Guard consisted of soldiers and workers, including some communists. They mobilized armed masses to defend Paris against the Prussian siege — and against the French government. The French bourgeois rulers were holed up in the Versailles palace, outside Paris. They sent troops to take the cannons of the National Guard, which were key for the defense of Paris. The masses of workers and National Guard soldiers loyal to them fought off a secret early-morning attack. They called on the government’s soldiers to refuse to fight for the capitalists. A woman confronted the soldiers: “Are you going to fire on us? On your brothers? On our husbands? On our children?” A noncommissioned officer left the ranks, faced his company and called out: “Turn your guns around and put your rifle butts in the air!” The soldiers obeyed. After a fierce battle, the masses forced the capitalists’ troops and their entire state apparatus to leave Paris and retreat to Versailles. The masses had won the day! The Central Committee of the National Guard set up elections for the Commune. Each district elected representatives. Most were workers with little experience in politics but complete commitment to the Commune. They organized the Commune Council and quickly mobilized the workers to re-establish all public services without bosses, administrators or supervisors. They collectively distributed food and coal to those who needed them at no cost. The masses helped make and carry out all the decisions through the Commune Council, section meetings and massive club meetings in the districts. Everyone was encouraged to participate. They changed all aspects of life—from production, to education to social relations to eliminating rent. The next article will describe more of their many achievements and also some shortcomings. 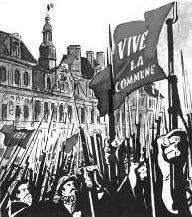 Let’s commemorate the Paris Commune this May Day by marching for communist workers’ power! The first article in this series showed how the Paris Commune, a major historical milestone, arose from the Franco-Prussian War (1870-71). It opened the era of working class world revolution. For the first time, workers took power and used it to organize and run society in their own interest. We build on their legacy by fighting for communism and nothing less: a world where the masses produce and distribute everything to meet their collective needs. The masses who organized the Paris Commune saw they needed armed struggle to set up and defend their new society. During the Prussian siege of Paris, the masses went hungry and died of disease while the rich drank champagne. The masses converted town halls into soup kitchens and closed-down theaters into Red Club centers that housed refugees and became forums for daily discussions. There, workers made a mass idea of the Commune as an alternative to capitalist power. The Commune started a new way of living. They declared a moratorium on rent and prohibited evictions. They took over hotels to house those made homeless by the war and by Napoleon III’s destruction of their neighborhoods. They encouraged workers to take over their workplaces. Women participated in all aspects of the Commune. They freed education from the control of the Catholic Church, which they attacked for defending the rich and only teaching workers’ children to be wage slaves. They said that education and work should be combined for a person’s whole life: “A person who wields a tool must be able also to write a book with feeling and talent.” They insisted that girls should be educated as well as boys. By 1871, the National Guard in Paris had grown to 340,000 troops. Many unemployed workers had joined for the small stipend. Others joined to defend Paris. The Guard had elected their own officers for a hundred years, as a way to entice the rich to serve in the guard to defend France. But now that angry and hungry workers were joining in huge numbers, they chose leaders who represented the workers’ interests. Some were communists. National Guard units had constant mass political discussions. The French government became terrified of the Paris National Guard and the masses’ growing rebellion. On March 18 the French Army came for their cannons. But the Paris masses defeated the French Army, sending them back to Versailles. The Blanquists, who were Marxists, argued for marching on Versailles immediately on March 19 to seize the initiative while many French troops and officers were still German prisoners. They urged the defeat of the French capitalists while calling on sympathetic soldiers and the workers throughout France to support the Commune. Unfortunately, they had not yet built a mass base for this strategy. They were defeated by the more numerous followers of Proudhon, an anarchist who argued for setting up the Commune as a model of social transformation first while negotiating with the government. Instead of marching on Versailles, they held elections to the Commune Council. But the rulers in Versailles had no intention of negotiating. They intended to crush the Commune and take Paris by force. Soon after the Commune began, the French government began attacking it and bombing the outskirts of Paris. By the time the communards marched on Versailles, the French capitalists had regrouped. They had surrendered to the Prussians. In return, the German bosses, equally afraid of working-class insurrection, released thousands of captured French troops to attack the Paris Commune. The communards held the French army at bay for two months, fighting battles every day. Finally, at the end of May, the French bosses’ army attacked Paris with 200,000 troops. They unleashed a campaign of murder and terror against the Parisian masses, aided by the German government and army. During a week of intense fighting, the masses set up and bravely defended huge barricades, but there was no centralized plan. Between 3,000 and 10,000 communards were killed. Afterwards, tens of thousands more were executed on orders from the French government (supported by all other capitalist governments) to try to erase the memory of the Paris Commune. The masses fought with fierce commitment to the Commune. But they lacked a clear centralized strategy based on the understanding that the capitalist state, the mortal enemy of the working class, must be eliminated and replaced by a communist society. And they lacked a mass communist party to lead their struggle. When faced with imperialist war and mass starvation, the masses rose up, took power, and attempted to set up a society on communist principles. It is a beacon for the world’s workers today; its valuable lessons belong to the entire working class. 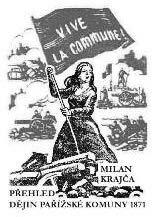 This May Day, let’s Remember the Paris Commune and March for Communist Workers’ Power! 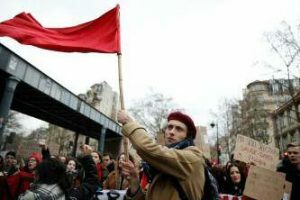 PARIS, March 29 — Tens of thousands of workers, teachers and students flood the streets in solidarity with rail workers who are disrupting France with intermittent strikes. They are protesting changes proposed by President Macron to the rail system, university admissions, and to unemployment and pension benefits. Rail workers in the United Kingdom have also walked out. As the 50th anniversary approaches of the French worker-student uprising in “May 1968,” many are calling for a “May 2018.” If another objectively revolutionary situation develops, let’s take advantage of it this time by mobilizing masses for communism. More next issue! The Paris Commune of 1871 marked the first time in history that the working class, acting in its own class interests, took state power, if only for two months. It did not and could not – given the objective and subjective conditions at the time –fully achieve its goal of creating a new society in the communist vision that they held. It nevertheless blazed new trails in our class’ struggle for its emancipation from capitalist exploitation, leaving invaluable lessons for future generations of communist revolutionaries. On March 18, 1871, the Central Committee of the Paris National Guard proclaimed, “The proletarians of Paris have understood that it is their duty to render themselves masters of their own destinies by seizing upon the governmental power. Unlike many radicals then and now, the Communards boldly declared that only the working class can liberate the working class. As they embarked on this path, increasing numbers saw that they needed to destroy the capitalist state apparatus. They saw and understood that its essence is armed violence against the masses to keep them exploited and oppressed. Therefore, the very first act of the Commune Council was to declare that the National Guard (a workers’ militia) should replace the capitalists’ permanent armies, which were instruments of oppression. Working-class women played a key role in every aspect of the Commune from its beginning to its final battles. They were political as well as military leaders. They were key in convincing soldiers in the government army to side with the Paris masses on March 18. Women helped build barricades and fought heroically to the end to defend them. Many times they led charges against the enemy. The Commune’s struggle was mainly restricted to Paris and they failed to immediately march on Versailles to defeat the French government. But the revolutionary workers believed the struggle had to be international. 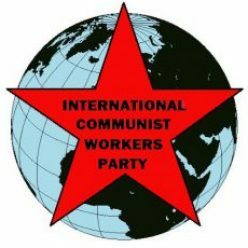 The Commune fought for and practiced internationalism. At a time when French nationalism was at fever pitch in the war against Germany, they welcomed German, Polish, Russian and Italian communards as part of the Commune Council. As the last article explained, the capitalists feared the Commune (see icwpredflag.org/parcom). They brutally attacked it to try to drown in blood its heroic example and crucial lessons. They shed rivers of workers’ blood — but wipe out its memory? Never! “Mindful of the lessons of the Commune,” Lenin wrote in 1908, the Russian workers “knew that the proletariat… must never forget that in certain conditions the class struggle assumes the form of armed conflict and civil war; the interests of the proletariat call for ruthless extermination of its enemies in open armed clashes. Only nine years later, during World War I, the Russian workers led by the Bolsheviks “stormed the heavens” again. They consolidated workers’ power over one-sixth of the world’s surface and inspired an epoch of revolutionary struggle worldwide. Russian communists, and later Chinese communists, learned from the Commune that the working class needs its own communist party to lead it to victory. Russian communists built the Bolshevik Party, especially among industrial workers and soldiers. The Chinese organized mainly among the rural proletariat. But they fought for and built socialism, which they thought would lead to communism, and which kept money and banks. This was a fatal mistake. The party that they built to fight for socialism is not the party we need to fight for communism. That’s why we are building ICWP as a party of a new type: one that forges unbreakable ties among workers and soldiers everywhere. A party with millions of communist critical thinkers and doers that mobilizes the masses for communism. A party in which the masses are more and more active in creatively and enthusiastically building communism. The Paris Commune showed that capitalism-imperialism’s inevitable wars are an opportunity for communist revolution. Masses under attack can and must be won to mobilize for communism and nothing less. This May Day, let’s celebrate the Paris Commune by marching for communist workers’ power!